1st row: Robert Perrin, Gwendolyn Towne Harper, Darlene Miller, Yvonne Jeanette, Susan Rocca, Connie Curtis, Karen Woodrow, Deborah Colton. 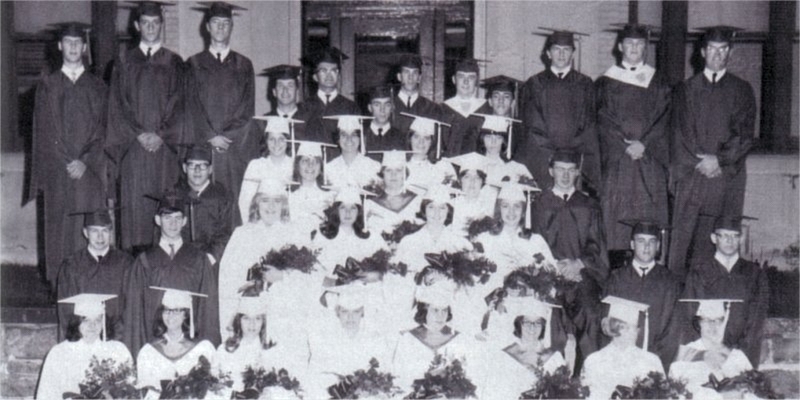 2nd row: Orson Paro, Dennis Dana, Donna Clarke, Sandra Carlin, Rita Carbine, Gloria Bogart, Stephen Hewlett, Gerald Fitzgerald. 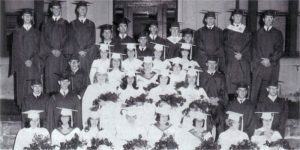 3rd row: David Blackmer, Jeanie White Lansing, Lee Jannie Perry, Lorna Enslow, Valerie Manning Beachard, Wilma White, Carol Mackin, Sarah McBroom, Lloyd Barrigar. Standing: Rodger Williams, Michael Peabody, Richard Sawyer, Ronald Hance, Keith Caswell, James LaRock, Gary White, Charles Partlow, David VanBrocklin, Robert White, Reginald LaPoint, Thomas O’Brien.